I am looking for Postdoc for machine learning research. I have moved to University of Tokyo (Apr/2017). I am interested in Statistics and Machine Learning, especially the following research topics. Born in Japan, Oct, 1981. Bachelor of Engineering from Mathematical Engineering Course, Department of Mathematical Engineering and Infomation Physics, Faculty of Engineering, The University of Tokyo, 2004. Taiji Suzuki: Adaptivity of deep ReLU network for learning in Besov and mixed smooth Besov spaces: optimal rate and curse of dimensionality. ICLR2019, accepted. arXiv:1810.08033. Atsushi Nitanda, Taiji Suzuki: Stochastic Gradient Descent with Exponential Convergence Rates of Expected Classification Errors. AISTATS2019, accepted. arXiv:1806.05438. Taiji Suzuki, Hiroshi Abe, Tomoya Murata, Shingo Horiuchi, Kotaro Ito, Tokuma Wachi, So Hirai, Masatoshi Yukishima, Tomoaki Nishimura: Spectral-Pruning: Compressing deep neural network via spectral analysis. arXiv:1808.08558. Atsushi Nitanda and Taiji Suzuki: Stochastic Particle Gradient Descent for Infinite Ensembles. arXiv:1712.05438. Ryota Tomioka and Taiji Suzuki: Spectral norm of random tensors. arXiv:1407.1870. Taiji Suzuki: Fast Learning Rate of Non-Sparse Multiple Kernel Learning and Optimal Regularization Strategies. Electronic Journal of Statistics, Volume 12, Number 2 (2018), 2141--2192. doi:10.1214/18-EJS1399. Yuichi Mori and Taiji Suzuki: Generalized ridge estimator and model selection criteria in multivariate linear regression. Journal of Multivariate Analysis, volume 165, pages 243--261, May 2018. arXiv:1603.09458. Song Liu, Taiji Suzuki, Relator Raissa, Jun Sese, Masashi Sugiyama, and Kenji Fukumizu: Support Consistency of Direct Sparse-Change Learning in Markov Networks. The Annals of Statistics, vol. 45, no. 3, 959–990, 2017. DOI: 10.1214/16-AOS1470. Song Liu, Kenji Fukumizu and Taiji Suzuki: Learning Sparse Structural Changes in High-dimensional Markov Networks: A Review on Methodologies and Theories. Behaviormetrika. 44(1):265–286, 2017. DOI: 10.1007/s41237-017-0014-z. Yoshito Hirata, Kai Morino, Taiji Suzuki, Qian Guo, Hiroshi Fukuhara, and Kazuyuki Aihara: System Identification and Parameter Estimation in Mathematical Medicine: Examples Demonstrated for Prostate Cancer. Quantitative Biology, 2016, 4(1): 13--19. DOI: 10.1007/s40484-016-0059-0. Taiji Suzuki, and Kazuyuki Aihara: Nonlinear System Identification for Prostate Cancer and Optimality of Intermittent Androgen Suppression Therapy. Mathematical Biosciences, vol. 245, issue 1, pp. 40--48, 2013. Taiji Suzuki: Improvement of Multiple Kernel Learning using Adaptively Weighted Regularization. JSIAM Letters, vol. 5, pp. 49--52, 2013. Masashi Sugiyama, Takafumi Kanamori, Taiji Suzuki, M. C. du Plessis, Song Liu, Ichiro Takeuchi: Density Difference Estimation. Neural Computation, 25(10): 2734--2775, 2013. Makoto Yamada, Taiji Suzuki, Takafumi Kanamori, Hirotaka Hachiya, Masashi Sugiyama, Relative Density-Ratio Estimation for Robust Distribution Comparison. Neural Computation, vol. 25, number 5, pp. 1324--1370, 2013. Takafumi Kanamori, Taiji Suzuki, and Masashi Sugiyama: Computational complexity of kernel-based density-ratio estimation: A condition number analysis. Machine Learning, vol. 90, pp. 431-460, 2013. Takafumi Kanamori, Taiji Suzuki, and Masashi Sugiyama: Statistical analysis of kernel-based least-squares density-ratio estimation. Machine Learning, vol. 86, Issue 3, pp. 335-367, 2012. Takafumi Kanamori, Taiji Suzuki, and Masashi Sugiyama: f-divergence estimation and two-sample homogeneity test under semiparametric density-ratio models. IEEE Transactions on Information Theory, Vol. 58, Issue 2, pp. 708-720, 2012. Masashi Sugiyama, Taiji Suzuki, and Takafumi Kanamori: Density ratio matching under the Bregman divergence: A unified framework of density ratio estimation. Annals of the Institute of Statistical Mathematics, vol. 11, pp. 1--36, 2011. Masashi Sugiyama, Taiji Suzuki, Yuta Itoh, Takafumi Kanamori, and Manabu Kimura: Least-Squares Two-Sample Test. Neural Networks, vol.24, no.7, pp.735--751, 2011. Masashi Sugiyama, Makoto Yamada, Paul von Bunau, Taiji Suzuki, Takafumi Kanamori, and Motoaki Kawanabe: Direct density-ratio estimation with dimensionality reduction via least-squares hetero-distributional subspace search. Neural Networks, vol.24, no.2, pp.183-198, 2011. Taiji Suzuki, Nicholas Bruchovsky, and Kazuyuki Aihara: Piecewise Affine Systems Modelling for Optimizing Hormonal Therapy of Prostate Cancer. Philosophical Transactions A of the Royal Society, 368 (2010), 5045--5059. Masashi Sugiyama, and Taiji Suzuki: Least-squares independence test. IEICE Transactions on Information and Systems, vol.E94-D, no.6, pp.1333-1336, 2011. Takafumi Kanamori, Taiji Suzuki, and Masashi Sugiyama: Theoretical analysis of density ratio estimation. IEICE Transactions on Fundamentals of Electronics, Communications and Computer Sciences, vol.E93-A, no.4, pp.787--798, 2010. Masashi Sugiyama, Ichiro Takeuchi, Takafumi Kanamori, Taiji Suzuki, Hirotaka Hachiya, and Daisuke Okanohara: Least-squares conditional density estimation. IEICE Transactions on Information and Systems, vol.E93-D, no.3, pp.583-594, 2010. Masashi Sugiyama, Takafumi Kanamori, Taiji Suzuki, Shohei Hido, Jun Sese, Ichiro Takeuchi, and Liwei Wang: A density-ratio framework for statistical data processing. IPSJ Transactions on Computer Vision and Applications, 1 (2009), 183--208. Taiji Suzuki, Masashi Sugiyama, Takafumi Kanamori, and Jun Sese: Mutual information estimation reveals global associations between stimuli and biological processes. BMC Bioinformatics, 10(Suppl 1):S52, 2009. Masashi Sugiyama, Taiji Suzuki, Shinichi Nakajima, Hisashi Kashima, Paul von Bunau, and Motoaki Kawanabe: Direct importance estimation for covariate shift adaptation. Annals of the Institute of Statistical Mathematics. 60(4) (2008), 699--746. Taiji Suzuki, and Fumiyasu Komaki: On prior selection and covariate shift of $\beta$-Bayesian prediction under $\alpha$-divergence risk. Communications in Statistics --- Theory and Methods, 39(8) (2010), 1655--1673. Akimichi Takemura, and Taiji Suzuki: Game-Theoretic Derivation of Discrete Distributions and Discrete Pricing Formulas. Journal of Japan Statistical Society, 37 (1) (2006), 87--104. Heishiro Kanagawa, Hayato Kobayashi, Nobuyuki Shimizu, Yukihiro Tagami, and Taiji Suzuki: Cross-domain Recommendation via Deep Domain Adaptation. 41st European Conference on Information Retrieval (ECIR2019), accepted. arXiv:1803.03018. Taiji Suzuki: Adaptivity of deep ReLU network for learning in Besov and mixed smooth Besov spaces: optimal rate and curse of dimensionality. The 7th International Conference on Learning Representations (ICLR2019), accepted. [The proof of Proposition 4 can be found here (provided by Satoshi Hayakawa who pointed out the technical flaw).] (arXiv:1810.08033). Kazuo Yonekura, Hitoshi Hattori, and Taiji Suzuki: Short-term local weather forecast using dense weather station by deep neural network. In Proceedings of 2018 IEEE International Conference on Big Data (Big Data), pp.10--13, 2018. DOI: 10.1109/BigData.2018.8622195. Tomoya Murata, and Taiji Suzuki: Sample Efficient Stochastic Gradient Iterative Hard Thresholding Method for Stochastic Sparse Linear Regression with Limited Attribute Observation. Advances in Neural Information Processing Systems 31 (NeurIPS2018), pp.5312--5321, 2018. arXiv:1809.01765. Atsushi Yaguchi, Taiji Suzuki, Wataru Asano, Shuhei Nitta, Yukinobu Sakata, Akiyuki Tanizawa: Adam Induces Implicit Weight Sparsity in Rectifier Neural Networks. In Proceedings of IEEE 17th International Conference on Machine Learning and Applications (ICMLA 2018), pp.17--20, 2018. DOI: 10.1109/ICMLA.2018.00054. Atsushi Nitanda and Taiji Suzuki: Functional gradient boosting based on residual network perception. ICML2018, Proceedings of the 35th International Conference on Machine Learning, 80:3819--3828, 2018. arXiv:1802.09031. Atsushi Nitanda and Taiji Suzuki: Gradient Layer: Enhancing the Convergence of Adversarial Training for Generative Models. AISTATS2018, Proceedings of Machine Learning Research, 84:454--463, 2018. arXiv:1801.02227. Masaaki Takada, Taiji Suzuki, and Hironori Fujisawa: Independently Interpretable Lasso: A New Regularizer for Sparse Regression with Uncorrelated Variables. AISTATS2018, Proceedings of Machine Learning Research, 84:1008--1016, 2018. arXiv:1711.01796. Taiji Suzuki: Fast generalization error bound of deep learning from a kernel perspective. AISTATS2018, Proceedings of Machine Learning Research, 84:1397--1406, 2018. arXiv:1705.10182. Song Liu, Akiko Takeda, Taiji Suzuki and Kenji Fukumizu: Trimmed Density Ratio Estimation. NIPS2017, 4518--4528, 2017. arXiv:1703.03216. Tomoya Murata and Taiji Suzuki: Doubly Accelerated Stochastic Variance Reduced Dual Averaging Method for Regularized Empirical Risk Minimization. NIPS2017, 608--617, 2017. arXiv:1703.00439. Atsushi Nitanda and Taiji Suzuki: Stochastic Difference of Convex Algorithm and its Application to Training Deep Boltzmann Machines. The 20th International Conference on Artificial Intelligence and Statistics (AISTATS2017), Proceedings of Machine Learning Research, 54:470--478, 2017. Taiji Suzuki, Heishiro Kanagawa, Hayato Kobayashi, Nobuyuki Shimizu, and Yukihiro Tagami: Minimax Optimal Alternating Minimization for Kernel Nonparametric Tensor Learning. The 30th Annual Conference on Neural Information Processing Systems (NIPS2016), pp. 3783-3791, 2016. Heishiro Kanagawa, Taiji Suzuki, Hayato Kobayashi, Nobuyuki Shimizu, and Yukihiro Tagami: Gaussian process nonparametric tensor estimator and its minimax optimality. Proceedings of The 33rd International Conference on Machine Learning, pp. 1632–1641, 2016. Song Liu, Taiji Suzuki, Masashi Sugiyama, and Kenji Fukumizu: Structure Learning of Partitioned Markov Networks. International Conference on Machine Learning (ICML2016), Proceedings of The 33rd International Conference on Machine Learning, pp. 439–448, 2016. Taiji Suzuki and Heishiro Kanagawa: Bayes method for low rank tensor estimation. International Meeting on “High-Dimensional Data Driven Science” (HD3-2015). Dec. 14th-17th/2015, Kyoto Japan. Oral presentation. Journal of Physics: Conference Series, 699(1), pp. 012020, 2016. Taiji Suzuki: Convergence rate of Bayesian tensor estimator and its minimax optimality. The 32nd International Conference on Machine Learning (ICML2015), JMLR Workshop and Conference Proceedings 37:pp. 1273--1282, 2015. Satoshi Hara, Tetsuro Morimura, Toshihiro Takahashi, Hiroki Yanagisawa, Taiji Suzuki: A Consistent Method for Graph Based Anomaly Localization. The 18th International Conference on Artificial Intelligence and Statistics (AISTATS2015), JMLR Workshop and Conference Proceedings 38:333--341, 2015. Song Liu, Taiji Suzuki, and Masashi Sugiyama: Support Consistency of Direct Sparse-Change Learning in Markov Networks. The Twenty-Ninth AAAI Conference on Artificial Intelligence (AAAI2015), 2015. (arXiv:1407.0581). Taiji Suzuki: Stochastic Dual Coordinate Ascent with Alternating Direction Method of Multipliers. International Conference on Machine Learning (ICML2014), JMLR Workshop and Conference Proceedings 32(1):736--744, 2014. supplementary. (arXiv version: arXiv:1311.0622) This paper was also presented in OPT2013, NIPS workshop "Optimization for Machine Learning". Source code (Matlab). Ryota Tomioka, and Taiji Suzuki: Convex Tensor Decomposition via Structured Schatten Norm Regularization. Advances in Neural Information Processing Systems (NIPS2013), 1331--1339, 2013. Taiji Suzuki: Dual Averaging and Proximal Gradient Descent for Online Alternating Direction Multiplier Method. International Conference on Machine Learning (ICML2013), 2013, JMLR Workshop and Conference Proceedings 28(1): 392--400, 2013. Source code (Matlab). Masashi Sugiyama, Takafumi Kanamori, Taiji Suzuki, Marthinus du Plessis, Song Liu, and Ichiro Takeuchi: Density-Difference Estimation . Advances in Neural Information Processing Systems (NIPS2012), 692--700, 2012. Takafumi Kanamori, Akiko Takeda and Taiji Suzuki: A Conjugate Property between Loss Functions and Uncertainty Sets in Classification Problems. Conference on Learning Theory (COLT2012), 2012, JMLR Workshop and Conference Proceedings 23: 29.1--29.23, 2012. Ryota Tomioka, Taiji Suzuki, Kohei Hayashi and Hisashi Kashima: Statistical Performance of Convex Tensor Decomposition. Advances in Neural Information Processing Systems 24 (NIPS2011). pp.972--980. Taiji Suzuki, Masashi Sugiyama, and Toshiyuki Tanaka: Mutual information approximation via maximum likelihood estimation of density ratio. 2009 IEEE International Symposium on Information Theory (ISIT2009). pp.463--467, Seoul, Korea, 2009. Taiji Suzuki, and Masashi Sugiyama: Estimating Squared-loss Mutual Information for Independent Component Analysis. ICA 2009. Paraty, Brazil, 2009. Lecture Notes in Computer Science, Vol. 5441, pp.130--137, Berlin, Springer, 2009. Taiji Suzuki, Masashi Sugiyama, Takafumi Kanamori and Jun Sese: Mutual information estimation reveals global associations between stimuli and biological processes. In Proceedings of the seventh asia pacific bioinformatics conference (APBC 2009). Beijing, China, 2009. Taiji Suzuki, Masashi Sugiyama, Jun Sese, and Takafumi Kanamori: Approximating mutual information by maximum likelihood density ratio estimation. In Proceedings of the 3rd workshop on new challenges for feature selection in data mining and knowledge discovery (FSDM2008), JMLR workshop and conference proceedings, Vol. 4, pp.5--20, 2008. Taiji Suzuki, Masashi Sugiyama, Jun Sese, and Takafumi Kanamori: A least-squares approach to mutual information estimation with application in variable selection. In Proceedings of the 3rd workshop on new challenges for feature selection in data mining and knowledge discovery (FSDM2008). Antwerp, Belgium, 2008. Taiji Suzuki, Takamasa Koshizen, Kazuyuki Aihara and Hiroshi Tsujino: Learning to estimate user interest utilizing the variational Bayes estimator. Intelligent Systems Design and Applications (ISDA) 2005, 94--99. Wroclaw, Poland, September 2005. Tetsuya Hoya, Gen Hori, Havagim Bakardjian, Tomoaki Nishimura, Taiji Suzuki, Yoichi Miyawaki, Arao Funase, and Jianting Cao: Classification of Single Trial EEG Signals by a Combined Principal + Independent Component Analysis and Probabilistic Neural Network Approach. Proc. ICA2003, pp. 197－202. Nara, Japan, January 2003. Masashi Sugiyama, Taiji Suzuki, & Takafumi Kanamori: Density Ratio Estimation in Machine Learning. Cambridge University Press, 2012. Taiji Suzuki: Generalization error bound of Bayesian deep learning: a kernel perspective. 2017 Probabilistic Graphical Model Workshop: Structure, Sparsity and High-dimensionality, 2017. Tachikawa, Japan. 22-24/Feb,2017 (presented in 22/Feb/2017). Taiji Suzuki: Statistical Performance and Computational Efficiency of Nonparametric Low Rank Tensor Estimators. 2016 International Workshop on Spatial and Temporal Modeling from Statistical, Machine Learning and Engineering perspectives (STM2016), 2016. Tachikawa, Japan. 20-23/Jul,2016 (presented in 23/Jul/2016). Taiji Suzuki: Statistical Performance and Computational Efficiency of Nonparametric Low Rank Tensor Estimators. The First Korea-Japan Machine Learning Symposium, 2016. Seoul, Korea. 2-3/Jun,2016 (presented in 3/Jun/2016). Taiji Suzuki: Stochastic Optimization. Machine Learning Summer School 2015 Kyoto, 2015. Kyoto, Japan. 23/Aug-4/Sep,2015 (presented in 2-4/Sep/2015). Taiji Suzuki: Stochastic Dual Coordinate Ascent with ADMM. SIAM Conference on Optimization (SIAM-OPT2014), 2014. San Diego, USA. 19-22/May,2014 (presented in 20/May/2014). Taiji Suzuki: Some convergence results on multiple kernel additive models. Nonparametric and High-dimensional Statistics. CIRM, Luminy (17/December/2012--21/December/2012), presented in 18/December/2012. Taiji Suzuki: Fast learning rate of non-sparse multiple kernel learning and optimal regularization strategies. The 2nd Institute of Mathematical Statistics Asia Pacific Rim Meeting (2/July/2012--4/July/2012), Tsukuba, Japan. 4th July, 2012. Taiji Suzuki, Ryota Tomioka, and Masashi Sugiyama: Sharp Convergence Rate and Support Consistency of Multiple Kernel Learning with Sparse and Dense Regularization. arXiv:1103.5201. Taiji Suzuki: Fast Learning Rate of lp-MKL and its Minimax Optimality. arXiv:1103.5202. Ryota Tomioka, Taiji Suzuki, & Masashi Sugiyama: Augmented Lagrangian methods for learning, selecting, and combining features. In S. Sra, S. Nowozin, and S. J. Wright (Eds. ), Optimization for Machine Learning, MIT Press, Cambridge, MA, USA, 2011. Ryota Tomioka, Taiji Suzuki, & Masashi Sugiyama: Optimization algorithms for sparse regularization and multiple kernel learning and their applications to image recognition. Image Lab, vol.21, no.4, pp.5-11, 2010. Taiji Suzuki: ``Some convergence results of nonparametric tensor estimators.'' International Symposium on Statistical Analysis for Large Complex Data. Tsukuba University, Japan. 23rd/Nov/2016. Oral presentation. Taiji Suzuki, Nicholas Bruchovsky, and Kazuyuki Aihara: A computational method to predict PSA evolution for androgen deprivation therapy. Sixth International Symposium on Hormonal Oncogenesis (12/09/2010 -- 16/09/2010), Sheraton Grande Tokyo Bay Hotel, Tokyo, Japan. pp.46, poster session. Taiji Suzuki and Kazuyuki Aihara: Hybrid system therapy for prostate cancer. International Symposium on Complexity Modelling and Its Applications 2005, poster session. 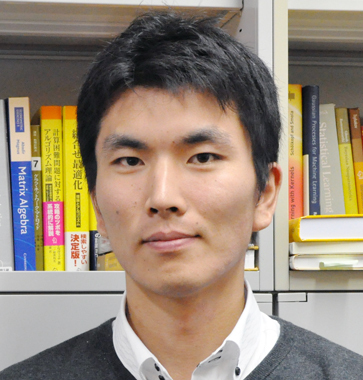 Taiji Suzuki: The Japan Society for Industrial and Applied Mathematics, Best paper award 2016. Improvement of Multiple Kernel Learning using Adaptively Weighted Regularization. Taiji Suzuki: IBISML (Information-Based Induction Sciences and Machine Learning), Best paper award 2012 (2012年度IBISML研究会賞). Dual Averaging and Proximal Gradient Descent for Online Alternating Direction Multiplier Method. MIRU優秀論文賞, Meeting on Image Recognition and Understanding 2008 (MIRU2008), 2008年 "Direct Importance Estimation - A New Versatile Tool for Statistical Pattern Recognition" Masashi Sugiyama (Tokyo Institute of Technology), Takafumi Kanamori (Nagoya University), Taiji Suzuki (University of Tokyo), Shohei Hido (IBM Research), Jun Sese (Ochanomizu University), Ichiro Takeuchi (Mie University), and Liwei Wang (Peking University).